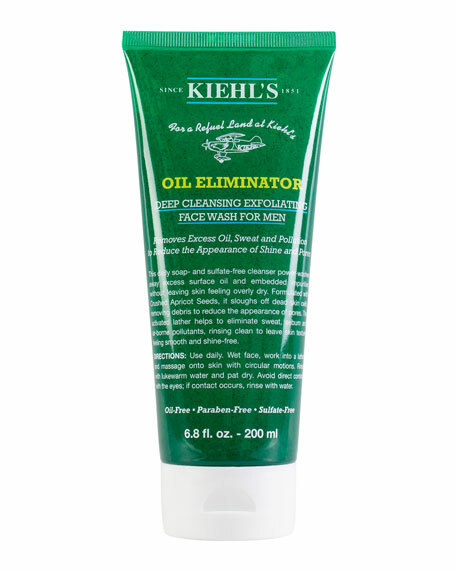 Kiehl's Since 1851 Oil Eliminator Deep Cleansing Exfoliating Facewash for Men, 6.8 oz. Kiehl's Since 1851Oil Eliminator Deep Cleansing Exfoliating Facewash for Men, 6.8 oz. Removes Excess Oil, Sweat, and Pollution to Reduce the Appearance of Shine and Pores. This daily soap- and sulfate-free cleanser power washes away excess surface oil and embedded impurities without leaving skin feeling overly dry. Formulated with Crushed Apricot Seeds, it sloughs off dead skin cells, removing debris to reduce the appearance of pores. The activated lather helps eliminate sweat, sebum, and air-borne pollutants, rinsing clean to leave skin texture feeling smooth and virtually shine-free. D. R. Harris's world famous Almond Oil soap contains nourishing almond oil to prevent dryness. This white, triple-milled soap is recommended for the most delicate of skin and has a rose, geranium, cinnamon and clove fragrance. Kiehl's Since 1851 Oil Eliminator Toner, 4.2 oz. Feed your beard. Treat your beard with a blend of 100% nutritious natural oils that penetrate straight to the cuticles.